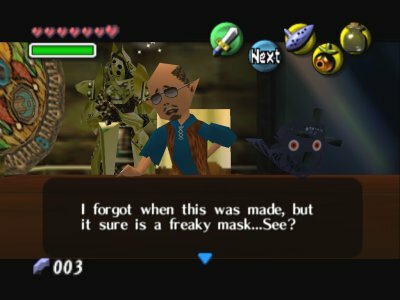 The Curiosity Shop is an odds-and-ends store in Majora's Mask. It opens only at 10pm, and is apparently run by the same man proprietor of the Trading Post next door, albeit in cognito with dark glasses and a bald head (The man's Trading Post persona wears a toupee). The shop deals in various stolen goods, and in-game dialogue reveals that the shop's proprietor deals with Sakon, the notorious thief. The main items for sale are a stolen bomb bag, and the All-Night Mask, which allows Link to stay up through long, midnight stories. If Link is unfortunate enough to have his sword or bottle stolen by the Takkuri bird, they will appear on sale here as well. The shop's owner is apparently embarrassed that his store sells stolen goods, judging from comments he makes to Sakon apparently absolving himself of guilt because he did not steal the goods himself. The owner is also friends with Kafei, and helps Link get Anju and Kafei together again by giving Link the Keaton Mask and a letter from Kafei to his mother. An image of the Curiosity Shop. A golden suit of armor (presumably worn by an Iron Knuckle) is visible in the back. The item for sale is the All-Night Mask. This page was last modified on 10 February 2006, at 02:41.